Provides an excellent deterrent to switching your inventory. Void insignia alerts you that someone has tampered with your stock. 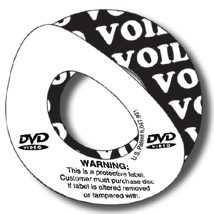 Preprinted warning: "Customer must purchase disc if label is tampered with or removed". Labels are silver printed with black ink. Available on rolls of 500 and pricing is per roll.